Would you like to build an online shop? Would you like it to be powered by Magento eCommerce platform? Free Magento themes are perfect for those who would like to give Magento a try. Download our best free templates and give your Magento store the professional edge. Free Magento themes help you get started with your store. All templates may be download immediately and used in your own creations. Click on the thumbnail to see more info on the template you would like to use. Each free Magento theme is ready to download in a handy zip file. All free Magento templates are easy to set up! Free responsive Magento theme to download. 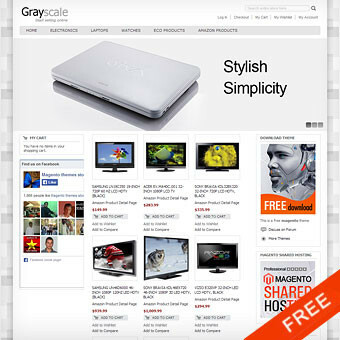 Grayscale is a theme that generously provide premium functionality. Neat and clean in appearance, strong and modern in built-in features. 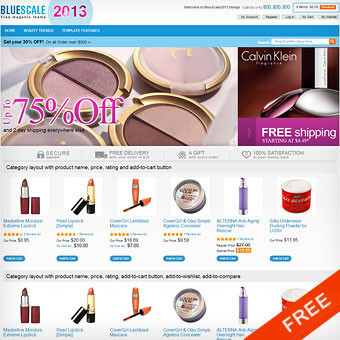 The theme is delivered with custom sample data and 8 most popular free Magento extensions. Give an impressive look for any fashion, jewelry or any type of online store. A multipurpose Magento Theme inspired by simplicity and blue color in design. Must-have free Magento Extensions and Sample Data included! 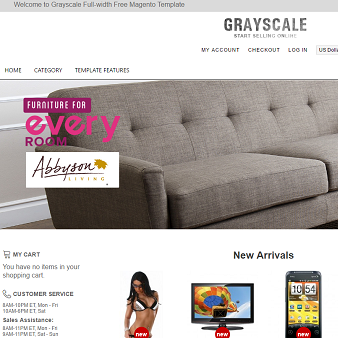 Grayscaleis multipurpose theme suitable for different online stores. Super-clean, elegant, minimalistic free theme built with Magento 1.4.-1.5-1.6-1.7-1.8-1.9.x.x. We are offering to you 5 different style of theme. Free EasyTabs module included. 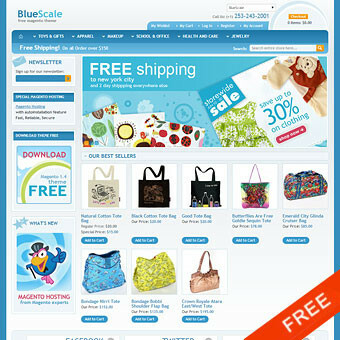 Let your store sparkle with sophistication with free Magento theme. This wonderful free theme gives you a chance to make your e-commerce store a glamorous one. Easy to set up. There are many free Magento themes, but almost all of them do not have enough quality. We have chosen the best of them for you. It allows you to set up a Magento store with a selected free Magento template in 3 minutes. Find the right theme for your store and make it your own. What we have prepared for you this time is a selection of the best premium Magento themes.